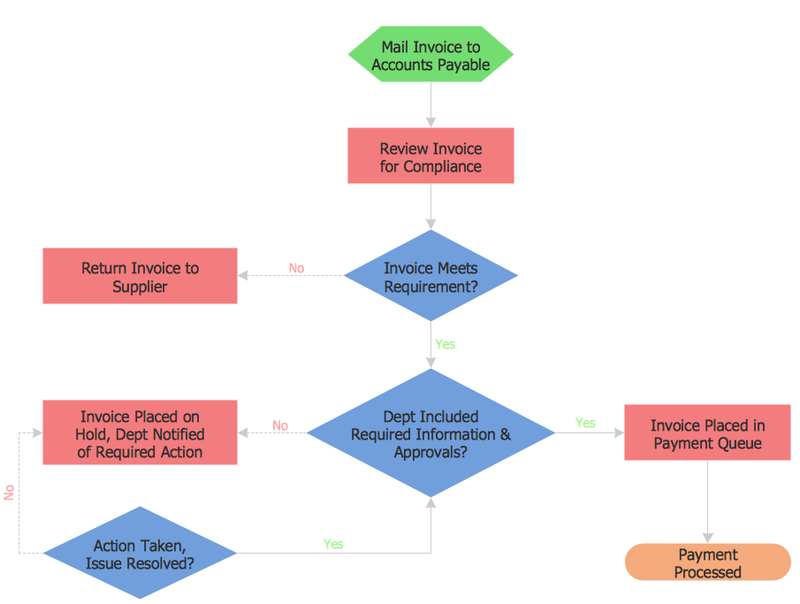 Graphic visualization of any complex process flow is a very common practice among business professionals. To make business flow diagram clear to anyone, there were developed a special collection of standard flowchart symbols, that will notate any element of any business process flow. The best practice of creating flowcharts using the software for flowchart diagrams supported with special vector libraries is using ConceptDraw Pro and its Flowchart solutions. To start creating your flow chart, it's better to open a special template. Search the Flowcharts solution, then choose the Basic Flowchart template and click to open it. Template opens in ConceptDraw DIAGRAM and now you have an initial diagram consisting of a set of standard flowchart symbols, followed with flowchart libraries. The flowchart diagram should have the Terminator symbol at the begging and the completion. Add the next object by clicking on its icon from the RapidDraw arrows that pop up when you bring the mouse cursor over the object. The new objects will be automatically drawn and connected to the previous ones. Use the Process symbol for activities or action steps, the Decision symbol to ask a question, and the Delay symbol to show a waiting period where no activity is done. Result: Now your flowchart is ready! With ConceptDraw DIAGRAM you can quickly and professionally depict any workflow, business process or other processes flows.